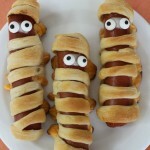 Halloween Mummy Hot Dogs using Crescent Rolls and cheese (our secret ingredient!). These make a yummy Halloween Dinner. 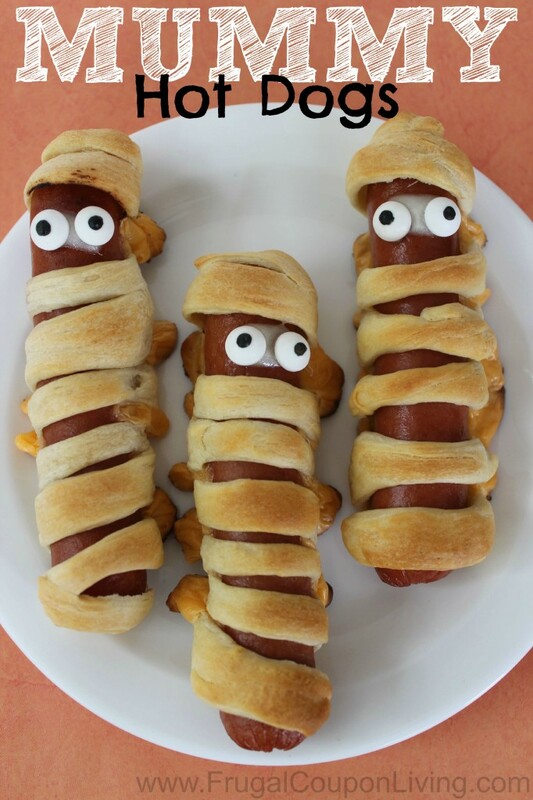 Every Halloween Party needs a silly Mummy – this Mummy Hot Dog Recipe is a fun kitchen food craft for the kids and will be a party favorite. Our secret ingredient – that makes this different form others online is the cheese! Make sure you add American Cheese Slices – yummy. For Breakfast, make sure to serve these tasty Dracula Vampire Halloween Donuts! Also check out our fun Halloween Food Crafts for Kids. If hosting a party, you will want to serve to serve drink with these Halloween Shocktail Bottle Labels (they are FREE!). Cut each cheese slice into 4 strips. Unroll dough and separate into 4 rectangles (crimp diagonal cuts in each one together). Cut each rectangle lengthwise into 1/2″ strips and join 2 together to form one long “bandage”. 10 pieces, making a total of 40 pieces of dough. Slice cheese slices into quarters (1/2 slice cheese, cut in half). Wrap “bandage” of dough around each hot dog and 1/4 slice of cheese. Make sure to leave a gap for face. Place wrapped hot dogs (cheese side down) on non stick cookie sheet and lightly spray with cooking spray. Bake 15 minutes or until dough is lightly brown. Place a small piece of cheese where eyes go and place in oven to melt slightly. Place 2 eyes on each mummy. Don’t stop there! Also explore all of our fun Halloween Food Crafts for Kids including more dinner recipes! Make sure you share with others. Pin this collage of recipes to your Halloween and Recipe Pinterest Boards. Take a look at this tasty Halloween Dessert – a Dracula Vampire Halloween Donuts! It is so easy, you just need some fake Vampire Teeth! Share on Pinterest so others can enjoy. These are so adorable!! So cute for Halloween!! Thanks for sharing! So cute- My kids will love this for Halloween. Came via Totally Talented Tuesdays. Your Halloween Mummy Hot Dogs look adorable! Hope you are having a great day and thanks so much for sharing this awesome post with Full Plate Thursday. cute my daughter want this one. Thanks for sharing with Hearth and soul bloghop. PInning. These are so stinkin cute for the Halloween holiday coming up! Thank you for sharing. Stopping in from the link up! FYI – We’re featuring your awesome post at this week’s Motivation Monday party! I am so excited. thanks @barb! What a fun snack! Thanks for linking up with What’s Cookin’ Wednesday! I made & took these to an Adult Halloween Dance & everyone thought they were so good & Yummy. I am so happy to hear that! Thank you for sharing Nancy!